We recently completed the design of a new aviation safety poster series for our client Global Aerospace, Inc., of Parsippany, NJ, a worldwide provider of aerospace insurance products and services. “We were challenged by Global Aerospace to make the topic of safety as engaging and memorable as possible to an audience of aviation professionals who are inundated with information,” said David Heitman, TCA president and creative director. “After exploring numerous creative approaches, we settled on a 1960s-era movie poster style that Jodee Goodwin, our VP of creative services designed. 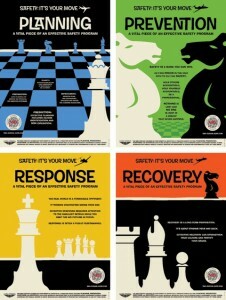 The four posters in the series address each of the four pillars of Global Aerospace’s SM4 Safety Program: Planning, Prevention, Response and Recovery.